My Starbucks addiction habit has been going for about 10 years. It started when I was in college - not quite old enough to go to the pub (legally), but a bit too old for hanging out at McDonalds. It was also a pretty good place to bunk off a 9am English class when I bumped into a friend on my way there! Now, I'm a bit of a contradiction because I'm not a big coffee drinker, so I began with hot chocolates. Then about 6 years ago my friend introduced me to the wonders of the Chai Tea Latte, and that's when the habit kicked in - there have been periods when I would buy one on the way to work every day and at £3.35 a time, that's not cheap! In the last two years I ventured into the world of coffee (one day, my local Starbucks ran out of Chai!) and now my special order is a Grande Half Shot Soya Vanilla Latte. Bliss. 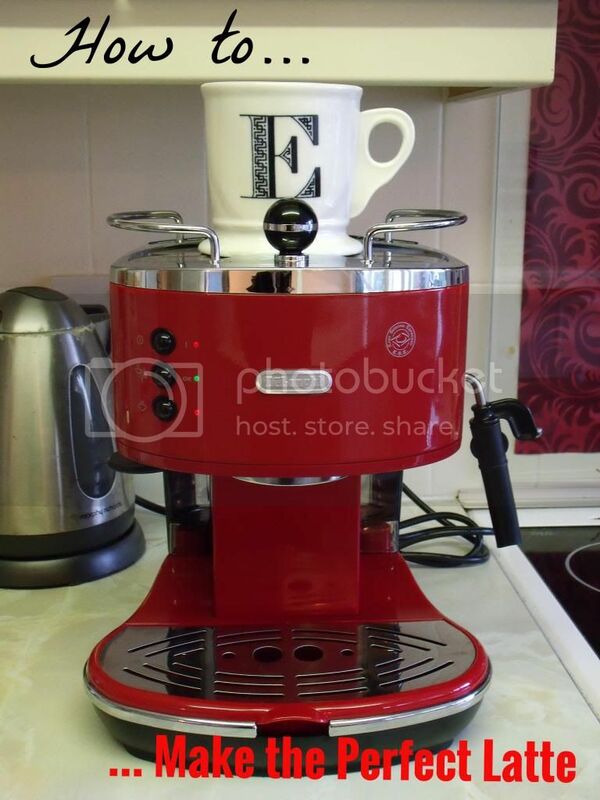 So, off we went to John Lewis and we bought a DeLonghi ECO310.R Icona Espresso Coffee Machine in Red. And because I know you're all dying to know how it works, I'm going to show you how to make the perfect latte! 1. Once you've filled up the water tank at the back, switch the machine on and place your pretty mug on the mug warmer at the top (Mine's from Anthropologie). Apparently it's important to warm your mug first and I'm happy to oblige because I think it helps! 2. I'm a big vanilla fan, so I popped down to my local Starbucks and got some of their lovely syrup. Funny story: A couple of years ago, we moved house within East London which meant I changed my local Starbucks. After about four months, I went in and a barista from my old Starbucks had started working shifts at my new Starbucks... she remembered me and my order! That gives you an idea of how much of a regular I was. I wonder if when I bought the syrup they realised they were losing one of their best customers! Anyway, I find that you don't need a lot of syrup, (you know in Starbucks they do two pumps?) just pour a little bit in, enough to cover the bottom of your mug. 3. Scoop ground coffee into the filter. Don't overfill it, but make sure it's filled level to the top. On the side of the machine there's a disc that you can press it against to pack the coffee down. Again, don't pack it too tightly. Too tight and the water won't be able to get through, too loose and it will pour through without filtering through the coffee. 4. When the green light shows, press the button. The machine might grumble a bit but the coffee should come out. When you've got the desired amount, press the button again to make it stop. 5. Now's the fun part - frothing the milk. You'll need a stainless steel milk frothing jug for the best effect (I don't know the exact science behind it but it just doesn't work as well in a ceramic or plastic jug - plus it gets pretty hot as the steamer heats the milk as well.) You don't need a lot of milk, it triples in volume as it froths so don't fill up the jug to the top! A barista friend recommended for perfect latte milk, stick the nozzle right down to the bottom, as it froths up bang the jug on the sideboard - this pops the bigger bubbles and makes more room. Gradually move the jug up and down to make sure the froth gets heated too. When the jug is just a little bit too hot to touch (probably takes about 30 - 40 seconds) then the milk should be hot enough for your latte. 6. Pour the the frothed milk into your mug about two thirds of the way up. Then pour in your coffee and top up the drink with any leftover frothed milk. 7. Curl up on the sofa with a good book and your perfect latte! Which makes a daily latte about 50p a time! Cost of the early morning coffee spent with the husband... priceless. Cracking. Have the same machine and was trying to work out how to make a latte (as opposed to a cappuccino which the instructions describe). Must give this a go later.